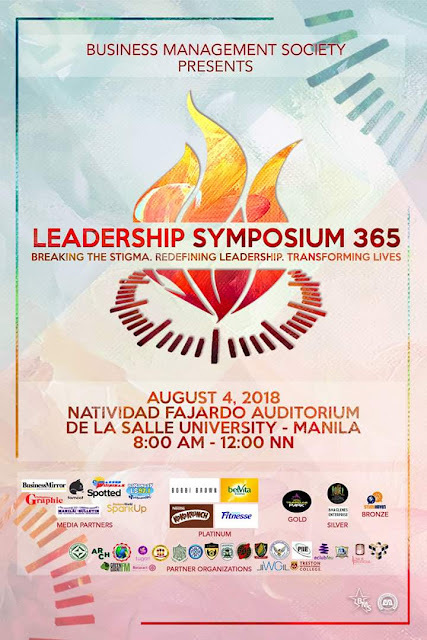 “Leadership Symposium 365” this August 4, 2018 (Saturday) from 8:00 am to 12:00 pm at the Henry Sy Sr. Hall in De La Salle University - Manila. On it’s 5th year, Leadership Symposium tackles the issue of what truly makes a leader and how leadership is manifested in our daily routines. This symposium will not only redefine what leadership is truly about but it will also help the audience acknowledge and understand the leader within so that they may confidently believe that they are already considered leaders of today. Breaking the Stigma. Redefining Leadership. Transforming Lives. Discover what truly makes a leader and how leadership is manifested in our daily routines. Join us in redefining leadership and acknowledging the leader within on August 4, 2018 (Saturday) from 8:00 AM to 12:00 NN in the Natividad Fajardo-Rosario Gonzales Auditorium (18th Floor of Br. Andrew Gonzalez Hall). Tickets are free of charge. Pre-register at our booth in Henry Grounds!